We are dedicated to assisting persons with disabilities and the elderly to become or remain valued members of the community since 1989. As a disability service provider in Iowa, The Larrabee Center is required to maintain accreditation for its services. Our Community Support Services (CSS) including waiver supported community living and home habilitation services undergo a review from the state to ensure policies and procedures are in place and being followed. A team of specialists from the state diligently review policies, client files, documentation and interview personnel. At the end of 2018, our CSS program went through the review process and received a 3-year accreditation. In January, our Employment Support Services program was up for a resurvey by CARF and also received a 3-year accreditation. CARF is an independent, nonprofit accrediting body whose mission is to promote the quality, value, and optimal outcomes of services through a consultative accreditation process. The latest accreditation is the 7th consecutive Three-Year Accreditation that the international accrediting body, CARF, has given to The Larrabee Center, Inc. Maintaining accreditation for our services ensures The Larrabee Center is not only meeting the requirements of a provider, but demonstrates a commitment to continued improvement and delivery of quality services to individuals, families and the community. We are truly honored to part of the community and will continue to strive for excellence. 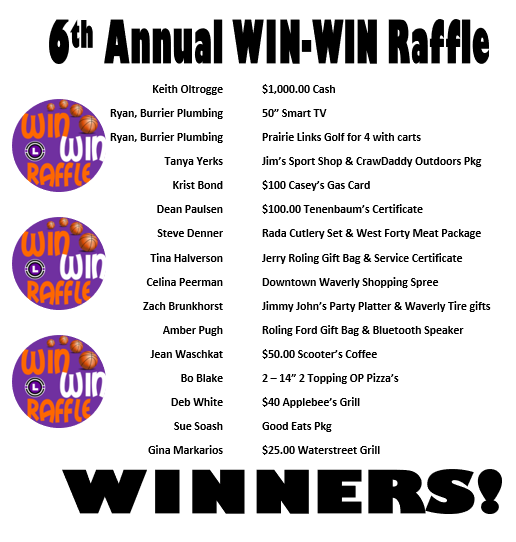 Our 6th Annual WIN-WIN Raffle was a HUGE success! And we couldn’t be more grateful to everyone who had a part of this success. Whether you bought tickets or your business sponsored a prize, each contribution is truly a gift and reminds us the importance of our mission in the community. This year our raffle raised over $6,500—exceeding our goal for this fundraiser. And thanks to the generosity of our sponsors, especially the many local business, 100% of the proceeds from this fundraiser will support our mission. 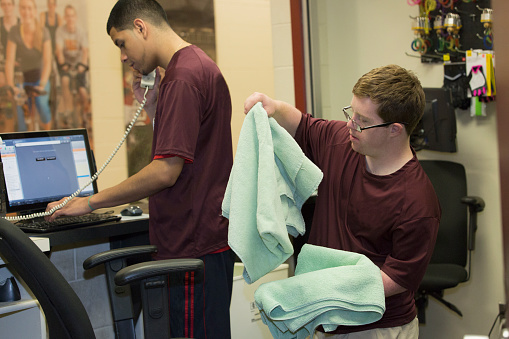 With individualized support services, we assist adults with disabilities and the elderly to increase their independence and be valued members of the community. March was Brain Injury Awareness Month. 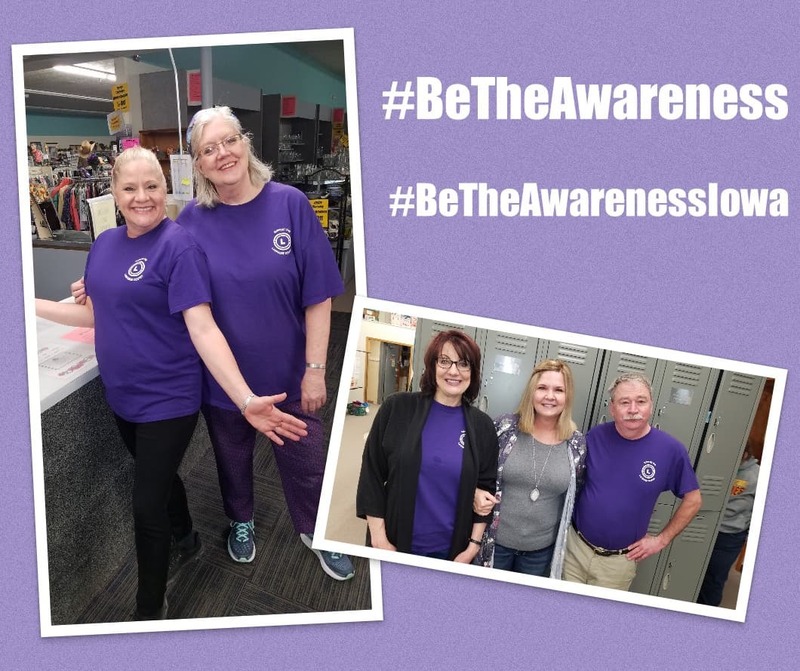 Every Thursday in March, staff donned purple as part of the Brain Injury Alliance’s Purple Thursdays Campaign to raise awareness about brain injury. Currently, more than 3.1 million children and adults in the U.S. live with a lifelong disability as a result of traumatic brain injury, and 6.4 million have a disability due to stroke. This translates to more than 95,000 Iowans living with disability from acquired brain injury. No two brain injuries are alike, and therefore, every individual will find their own unique definition of what that means—and it will continue to unfold over months and years. As individuals and families move forward, there are a variety of supports available in the state of Iowa that can help an individual live well with a brain injury. The Brain Injury Alliance of Iowa is a resource for brain injury prevention, advocacy, education, research, and support. For resources and information, visit biaia.org. April is Autism Awareness Month. 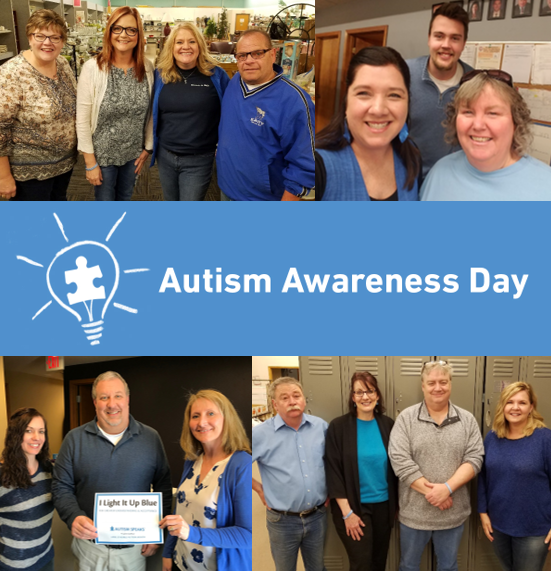 Staff wore blue on April 2nd as part of Autism Speaks’ #LightItUpBlue Campaign to raise awareness about Autism. There is not one type of autism, but many. Autism, or autism spectrum disorder (ASD), refers to a broad range of conditions characterized by challenges with social skills, repetitive behaviors, speech and nonverbal communication. According to the Centers for Disease Control, autism affects an estimated 1 in 59 children in the United States today. Because autism is a spectrum disorder, each person with autism has a distinct set of strengths and challenges. The ways in which people with autism learn, think and problem-solve can range from highly skilled to severely challenged. Some people with ASD may require significant support in their daily lives, while others may need less support and, in some cases, live entirely independently. Learn more at www.autismspeaks.org. Collaboration and partnership with the community is key to the success of our mission. Together, we can truly enrich lives and enrich the communities in which we live, learn and work. Transportation is one of the largest barriers our clients face. 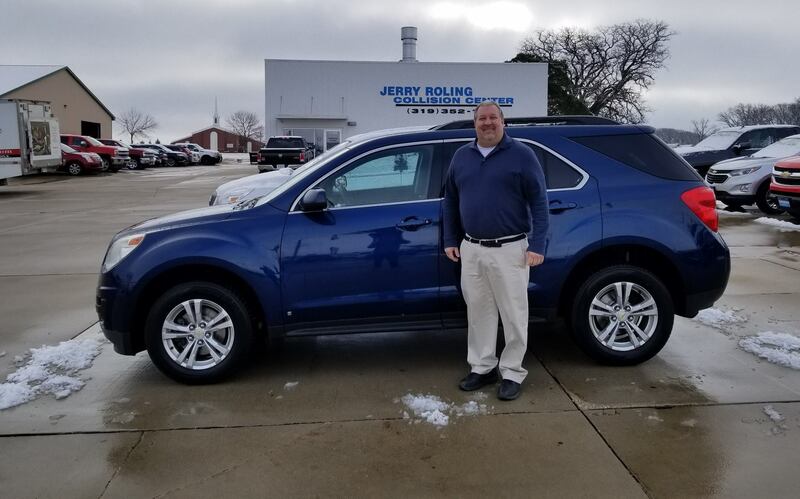 With the support of the Bremer County Community Foundation and Waverly Community Fund, we recently purchased a vehicle in our Community Support Service program. Having accessible and reliable transportation helps us ensure our clients can access the community for essential needs, connecting to resources and being involved in social and leisure activities. And thank you to our friends at Jerry Roling Motors ﻿for working with us on purchasing our new vehicle. Accessing supports and services can be difficult for those living in rural areas. It’s important to provide supports where people reside to allow them to live and grow in the communities they love. We’d like to recognize the Butler County Community Foundation for their support of our Community Support Services program which works with individuals to increase their independence and inclusion in their communities. We’d also like to thank the Grundy County Community Foundation for their continued support of our Trinkets & Togs Thrift Store in Grundy Center. Through the thrift store operations, we are able to serve the communities within Grundy County by offering work experience to students in special education programs, volunteer and job shadow opportunities for those exploring career options, as well as be a resource for the community to recycle gently used goods. Our presence in Grundy Center also allows us to provide in-home and employment services to individuals living in the county. The Larrabee Center was recently featured in the Waverly Newspapers Pillars of Progress Special Edition. Moving out on your own after high school and transitioning to the “real world” can be difficult for any young person and their family. For Andrew, having the support from The Larrabee Center made the transition easier and gave his family peace of mind. 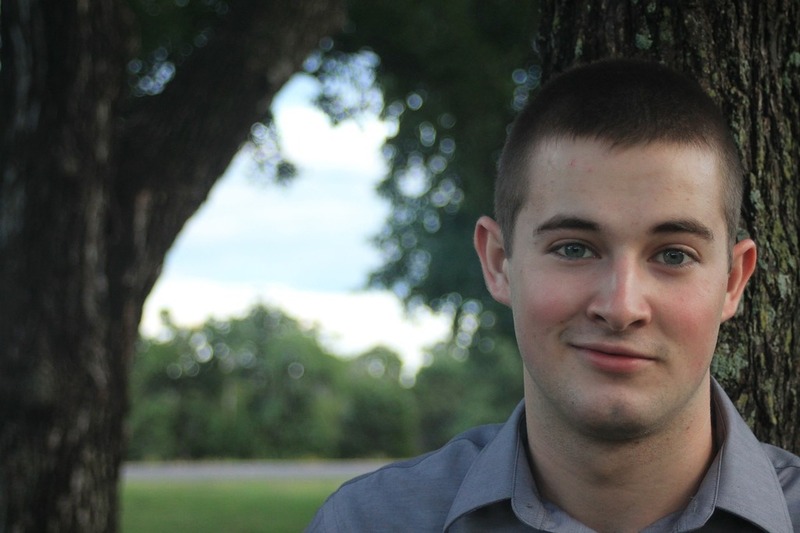 After high school, Andrew was living with his parents in rural Bremer County. He got a job at McDonald’s in Waverly but relied on his parents to drive him to work. Andrew was feeling ready to make the move to his own apartment and with the support of The Larrabee Center, he recently moved to Waverly. In-home services provide support to Andrew in accessing the community for social and leisure activities, running errands, and connecting to resources like housing assistance and regional transit. Now Andrew utilizes the regional transit bus to get to and from work. When he’s not working, he participates in community events and is learning more about what is available to him in Waverly. Andrew is increasing his independence, and friends, neighbors and coworkers are including him as a valued member of the community. Learn more about Community Support Services by visiting our website. 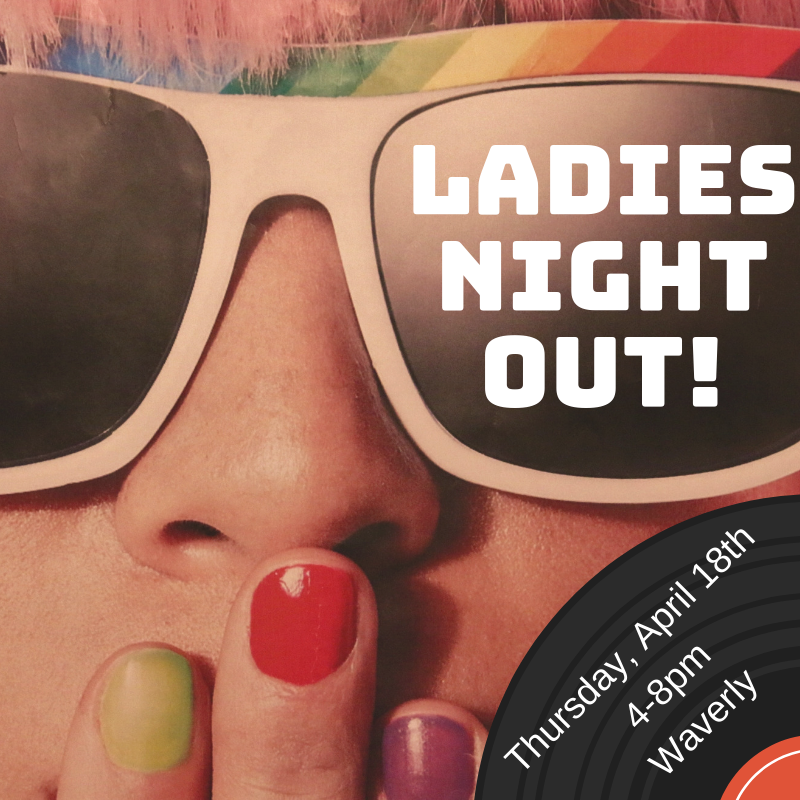 Let’s take it back to the 80’s with Trinkets & Togs on Thursday, April 18th for Ladies Night Out in Waverly! You’re totally gonna want to check out our Ladies’ Clothing BOGO Free Sale from 4-8pm. We’ll be rockin’ out with your faves from the 80’s and have some tubular eats for you to nosh. Join us in Grundy Center on Thursday, April 25th for the Chocolate Walk! Indulge in chocolate on us while you shop local retailers. We’ll have Purses 1/2 Price AND Necklaces and Earrings Buy One, Get One FREE from 3-7pm! The Larrabee Center, Inc. has approximately 70 employees working in various departments from direct support staff to retail staff at Trinkets & Togs Thrift Stores. 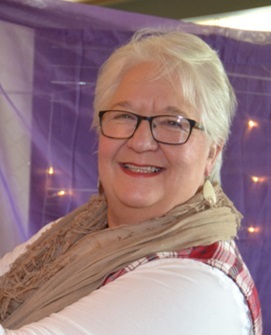 While the daily duties of a clerk in Grundy Center might look different than a job coach in Waverly, one thing that ties us all together is our mission. So we asked some of our staff—Why is the mission of The Larrabee Center important to you? Waverly Trinkets & Togs is looking for volunteers! Turn your Hobby into a Helping Hand! Whether you love Crafts or Purses, Fabrics or Books, we’ve got the spot for you! Come alone or with a friend! A gift to our endowment ensures the mission continues for years to come. Each gift will continue to grow as it is invested on behalf of the agency. Not only does your gift benefit us but it also benefits YOU! By donating to our fund you become eligible for a 25% Endow Iowa Tax Credit. Be a part of our mission! Donate online today!